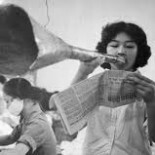 Contemporary artist and filmmaker Nguyen Trinh Thi reflects on her career as a documentary filmmaker recording the post-colonial experiences of modern Vietnam and all its complexity. Art Radar spoke to Nguyen Trinh Thi about her filmmaking process, what drives her practice and her role as a practicing artist in the region. Eleven Men combines footage from a range of Vietnamese classic feature films produced by the state-owned Vietnam Feature Film Studio with Franz Kafka’s short story Eleven Sons. Focusing on a single actress, Nhu Quynh, and spanning three decades of her career, Eleven Men transposes Kafka’s male family imaginary to the analysis of a woman’s relation to her lovers.